This is the type of show that only caters to its intended audience. You'll know immediately if you fall into that category. I'd just like to point out that just because they didn't aim this type of anime at you, it doesn't make it bad. It's very well done, the characters are interesting and have depth to them. As far as I know Rakugo has never been the main focus of an anime before. Because of its old-style of entertainment using anime as a median has the dangers of bastardizing and tarnishing classic stories. So far they've done a good job at avoiding that. Rakugo is the Hidden Gem of Winter 2016! Art & Sound: The animation isn't incredible or groundbreaking, but it successfully captures the emotion of the characters, making them come to life. The sound track is very traditional, which makes sense. Personally I like it. Story: This anime has a very unique premise, and from the looks of the first episode, I think it is going in a good direction. The narrative is lovely and the Rakugo itself is interesting and engaging. This anime has very rich dialogue, which really draws you in if you are willing to be invested. Characters: The true greatness of this anime lies within its characters. So far I have liked everyone I have met, and every characters is unique, both from each other and from characters in general. Yotaro is really great, he has easily become one of my favorite characters of the season, almost instantly. The girl Konatsu is also very unique and interesting/fun to watch. Moreover, all the characters are very true to life, which gives the anime a human feeling. Enjoyment: Easily one of my top 5 for the season. It has everything I am looking for: lovable characters, unique premise, flushed out story, ect. I may be the target audience, but even if you aren't I think you may enjoy watching such a unique piece of art. For those who don't know, this is a Josei anime, one that intended for a mature female audience. The only other Josei I can think of is Princess Jellyfish (Kuragehime), and this is also pretty great. *edit* Upon doing some research, other josei animes include: Usagi Drop, Chihayafuru, and Nodame Cantabile. What I really trying to say is that Josei anime rarely ever comes out! If you are looking for something like this, I would recommend Ping Pong the Animation (rich narrative, same style of characters) and Princess Jellyfish (same josei feeling). Episode one immediately sent chills down my spine. I watched it without reading the description, thinking "oh, this looks like another historical series", and I couldn't be happier about how wrong I was. The art of Rakugo is something I had never heard of before now, and yet after only one episode I feel very familiar with it. Instead of a montage or two where we'd see the main character learning how to perform, we actually get to see him acting out stories from beginning to end. It makes it easy to understand what exactly the point of Rakugo is, why people would like it so much, but more importantly, why the main character is so determined to master it himself. I highly recommend this series to anyone who is looking for a refreshing plot, a good laugh, and just enough dramatic tension to carry the story. includes minor spoilers, you have been warned. Let's get this out of the way, as others have already mentioned this is not going to appeal to everyone. It's a period piece about Rakugo, which simply put is a traditional Japanese form of stand-up comedy except the performer is sitting down and rather than tell jokes he tells a humorous story by portraying various characters. If this is appealing to you then read on, if not, well, better move on. The story itself proceeds very slowly and it's for the most part subtle about the way it explains things, using the "show, don't tell" meathod that most other anime don't use. For example, rather than a character talking about being haunted by the shadow of his dead friend the show simply shows a ghostly form of him appearing rather than the same character going on about it, the scene happens and that's about it, it's not analyzed heavily and the internal monologue about it is very short. Further, the show has, in its first episode, 2 seperate Rakugo acts performed by the characters. These take up rougly a third of the 50 minute run time of this episode with the first of the two acts taking up about 10 minutes. It does help the episode move faster than it would have otherwise. This is probably the truely major obsticle of the show, at least for Western viewers. The stories are old Japanese tales and are uniquely imbued with Japanese culture and sensibilities. It's not impossbile to understand, the first performance should be a story familiar to just about anyone, but it is told in a very different fashion which may not appeal to all or be readily understandable by all. I am a long time fan of Rakugo (and I was born in Showa). Every nuance, every gesture is beautifully captured. The story telling is first class. From the start, not a waisted moment in the show. Each scene leads to the next with impeccable flow and timing. I've never seen a show with such an impact from the first episode. The ending theme by Ringo Sheena makes this great show that much more special. a story about story-telling.. I love it! This is literally the story about an old-fashioned form of story-telling called Rakugo. I had no expectations for this show, but it turned out to be one of my favorites. I just find myself getting drawn in every episode. I can understand a lot of people wont be able to get into the Rakugo, itself.. but the characters in this show are incredibly real, and the writing and music backing those characters made this show an incredible experience. I will say this show is intended for a mature audience. you will not find anime tropes or any bizarre shonen action typical of most anime. the story and characters are deep, and the drama weighs heavily on the plot. there's enough comic relief to keep it from being overbearing, but im not sure younger audiences will appreciate this show. Shouwa Genroku Rakugo Shinjuu is currently airing, and we are eight episodes in, with the first episode being 45 minutes long. The show is incredible. It is set in multiple time periods, showing the legacy of two Rakugo performers, going from apprentice, to master. Fighting for the same lover, and inevitably ending in tragedy. However, it brilliantly weaves this story in with a cast of younger apprentice characters, who are being told this story over the course of the show. The soundtrack is a heavy mix of jazz, blues, and classical Shōwa period instrumentals, with lots of shamisen, taiko and other Japanese percussion. The blend of traditional Japanese and jazz music makes for an incredibly unique atmosphere. So far most of the show is pre and post WW2, which is a great setting for a period piece, that isn't used nearly enough. The show has a perfect blend of drama, romance, humor as well as fascinating and entertaining rakugo stories, told by an excellent voice cast. The art and animation is perfectly directed so far. I think this series is going to turn out to be the best show of the season, and perhaps one of the best of 2016. The problem is that nobody is checking it out. I think people are turned off by the "Josei" tag, and I don't see anything particularly "josei" or fruity about the show. It doesn't follow a majority of those tropes, only one of the character designs does. I'd describe this show as a romance, seinen, drama. 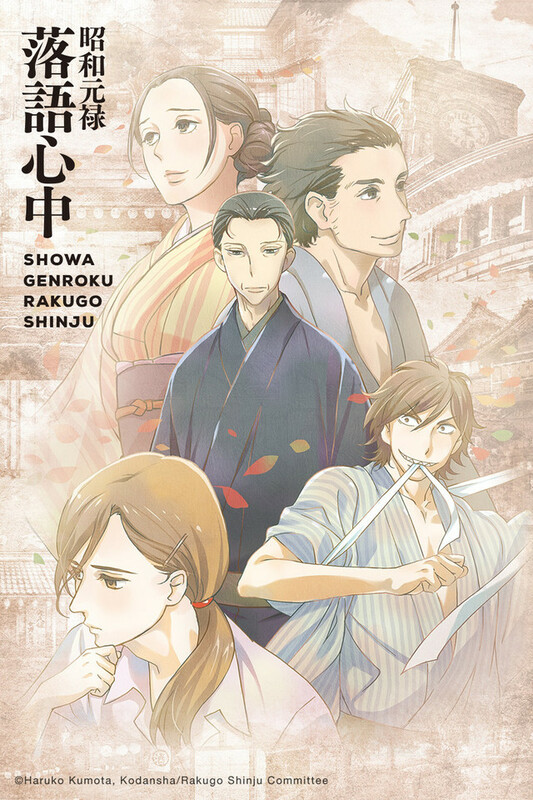 If you love the fun dialogue with an "adult cast" like in Space Brothers, or the classic Japanese style storytelling of Mushi-shi, I think Shouwa Genroku Rakugo Shinjuu is for you. The classiest show airing. Crunchyroll found itself a real gem here. It just might be my favorite of the season. Forget the fact that you are watching an anime. Forget the fact that you are in your room looking at a screen and expecting to be entertained with fast moving images and loud noises. You're listening to a story about a storyteller telling stories. You're listening to a story about the life of a storyteller who came to tell stories. If that's okay with you, if you like hearing funny stories, then you will definitely be amused by this anime. Even though this anime is about a kind of Japanese theater that I would best describe as stand-up storytelling, and although I definitely want to give credit to the voice artists that do an amazing job telling these stories, I do want to give credit to the artists who do a great job animating the different facial features and body language that help sell the stories. Audio, graphics, and plot all come together extremely well in this series. You found yourself a real gem of a series, Crunchyroll. Unlike the usual trash anime that comes out ever year this show stands above them. It's beautifully animated with characters you will be invested in 20 minutes into the first episode. I'm glad the first episode is longer. It gives up time to really sink into the story. It makes episode two and the continuing Plot much more enjoyable. Please don't pass on this show. Yes it doesn't have explosions, action, or fan service but it has drama, comedy, emotion, story, and a feel to it unlike any other show this season. I enjoyed this anime from start to finish. All of the characters were unique, and likable in their own ways. It was an incredible emotional rollercoaster ride, and I loved every minute of it. I would recommend this to anyone who enjoys character drama, a little mystery, and a semi-historical setting. I would most certainly rewatch it.